Nobody likes a spoiler. And when it comes to the twist-laden movies of M. Night Shyamalan, I would be dead in the water, unable to see the forest for the trees, if I even hinted at some of those big reveals. So consider this a warning—your only warning—about reading any reviews of Glass, the director’s new thriller. If you’re a Shyamalan fan, you should hold off on diving into this piece before you see it. Skip it afterward, too, especially if you’re the kind of viewer who confuses single-stringed cello scraping for seriousness. Critics are only going to harsh your happy existence, a hermetically sealed theme park of your own devising. We good? Good. Split, a 2016 comeback of sorts for the filmmaker, was a reasonably tight serial-killer drama starring James McAvoy as a teen-abducting psychopath—that is, until its final seconds, when it unmasked itself as a stealth sequel to Shyamalan’s Unbreakable, a fine-tuned bit of crazy that posited superheroes were real and living in Philadelphia. 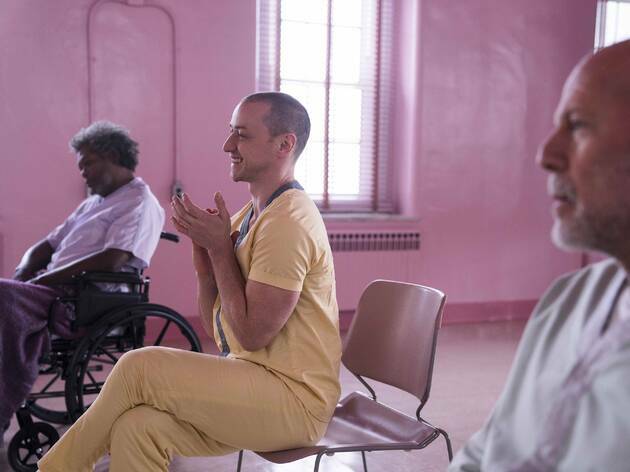 Glass is the follow-up to both movies, and the overindulged Shyamalan really wants to let us know how cool that is. The majority of his running time is dominated by dull, painfully verbal group-therapy sessions at a secret lab, where McAvoy’s captured cannibal, known as the Horde, sits alongside Bruce Willis’s somber avenging angel David Dunn (a.k.a. the Overseer) and Samuel L. Jackson’s Mister Glass, a brittle-boned villain in a wheelchair who’s prone to speechifying when he’s not behaving catatonic. Shyamalan spends so much time on this are-they-or-aren’t-they-super question that he’s forgotten how to mount a persuasive escape sequence—the action is your typical WrestleMania stuff. There’s an ominous office tower being built downtown, but you’ll be shocked by how undisciplined his script is. It lacks a real climax, yet has room for multiple scenes set in comic-book stores, plus a lengthy and unnecessary cameo for himself. Does it end with a cute, unexpected jab to the ribs? You bet. That shiver of pure nothingness won’t be ruined here, but just to be perfectly clear: This review has no ulterior motive in disproving the secret lives of superheroes, only the talents of one formerly gifted filmmaker.